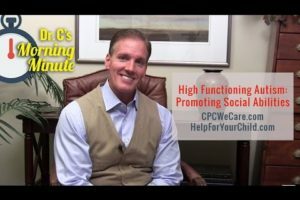 High Functioning Autism: Promoting Social Abilities. If you have a child with high functioning Autism, you may find that your child does not fit in social skills groups. Finding the right fit can be a challenge. Learn more by watching this morning’s Morning Minute. Feel free to request a topic of your choice by emailing me at jcarosso@cpcwecare.com.